Shikha Inn Resort is situated in lush green alphine forests and over mountain ridges in Bhimtal. All the rooms are opened from all side to have a view all around, rooms had a perfect blend of luxury and wilderness in the lap of himalayas. The Resort is spread in the vast area. Shikha Inn resort has 20 delightfully furnished rooms, in which 12 rooms are Super Deluxe, 6 rooms are Deluxe and 2 Family Suites. Each room is thoughtfully designed to enhance your experience of togetherness and is equipped with all modern facilities. The resort has open lush green lawns for marriages, reception, dinner, open air bar-be-que. You can also enjoy outdoor games like Cricket, Volleyball, etc. 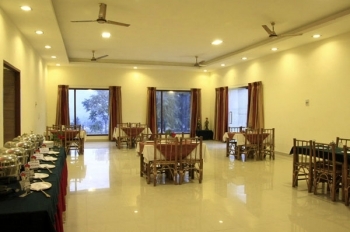 Hotel Shikha Inn has a multi cuisine restaurant. - MAP Accomodation + Bed Tea + Breakfast + Lunch / Dinner + Boating. Bhimtal is well connected to all Metro cities with road network. The nearest railway station to Shikha Inn Resort is Kathgodam. Delhi is 290 kms, Lucknow is 366 kms, Mussorie is 395, Mukteshwar is 55 kms, Corbett is 105 kms, Nainital is 17 kms, Almora is 60 kms and Ranikhet is 60 Kms from the resort in Bhimtal.